One benefit of living in the UK is the National Health Service, a public health service which provides free healthcare to UK citizens. While this covers the majority of a person’s healthcare needs, according to the Office for National Statistics, the average UK person spends around £2,000 on healthcare every year; a number that is steadily rising. (Source) Broken down, this is about £166 per month or £38 per week. I don’t know about you, but I can think of other things I would rather spend £38 on per week. 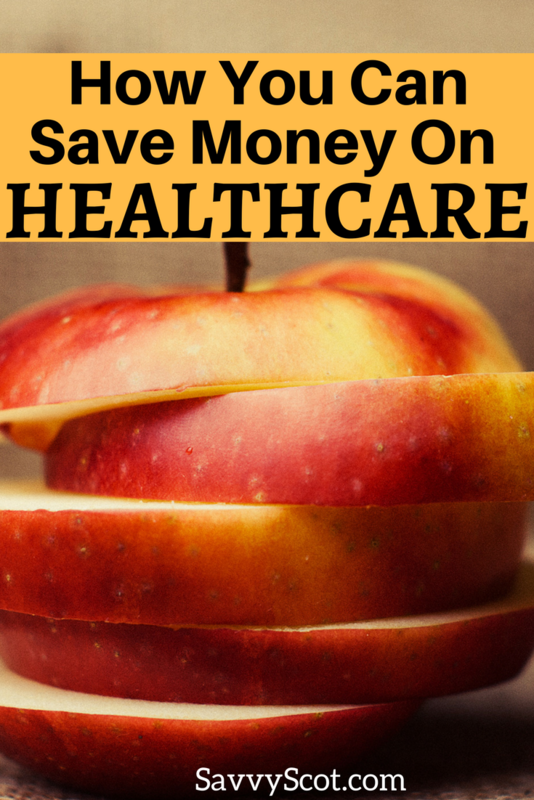 In order to save on healthcare you must make some changes. First of all, prevention really is the key. A healthy person is less likely to get sick. Exercise regularly. Walk as often as you can. Low impact exercises, such as walking, help build strong bones meaning yours are less likely to become brittle or break. Get your heart pumping with frequent cardio session. Exercise doesn’t have to be done at a gym to be beneficial. Regular checkups are another form of prevention. Annual exams can help keep an eye on any problem that may be arising (like high blood pressure or high blood glucose) allowing you to tweak your lifestyle in order to nip these in the bud. Make sure you are following up on any issues previously noted by your doctor. Basic hygiene includes washing hands, brushing teeth, and showering regularly. These can all prevent the spread of germs, thus reducing the chances of becoming ill. If you are out and about, bring some hand sanitizer along. Avoid directly touching surfaces that are handled frequently by other. If you find yourself ill, combine appointments when necessary. Doing this can mean missing work less and spending less on fuel for numerous trips. Less time away from work means more money in your pockets. If you are prescribed a medication, ask for the generic version. These are held to the same high standards as a name brand medication, but appear at a greatly reduced cost. Instead of taking supplements, include a wide variety of fruits and vegetables in your diet to get the vitamins and minerals your body needs. Nutrients from foods are usually absorbed and used better than ones from supplements. If a supplement or vitamin has been recommended by a doctor, you should follow their advice. Shop around. Don’t be afraid to ask for a discount. Get samples when available. Many doctors have cabinets full of samples. Contacting a drug manufacturer could also help you obtain free samples. Simply by asking questions you can reduce the cost of healthcare. How? Let’s say you go to the doctor and they order 3 tests. Only one of those tests is really necessary. Question the need for additional tests or medication that may not be needed. Approximately 10% of UK citizens have private healthcare. figure out if your private healthcare insurance is working for you. Are you paying more than you should? Is there an alternative provider that you could use? Ask yourself these questions, and see if there is something better out there for you. Keep in mind that all advice here should be discussed with your doctor. Before beginning a diet or exercise regimen, clear it with your doctor. What are some ways that you cut healthcare costs? Let us know in the comments. I just eat an apple bcz an apple keeps the doctor away jokes apart but I really care my self.